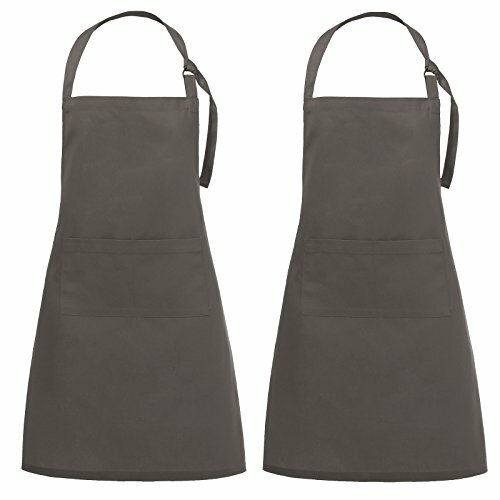 The VEEYOO deluxe Adjustable Chef Bib Apron (2 Pockets) features an ultra-durable 8 oz. performance twill fabric. Material upgrade. The perfect balance between 80% polyester and 20% cotton ensures this apron is durable enough to take daily abuse at work while maintaining a desired level of softness and comfort. 5. Two 6.5" deep (5.5" wide) front pockets provide the added convenience for quick access to your checkbooks, writing instruments or other needed supplies. 6. Personalize your aprons for a one-of-a-kind look. Imprint space for logo printing, monogram and embroidery makes the apron great gift for the ones who love to spend time in the kitchen, and helps protect your uniforms from stains to make your workday easier.